Corey and I are not the only ones heading back to Toronto thinking that Ottawa seriously represented at HackOTT and blew our minds! 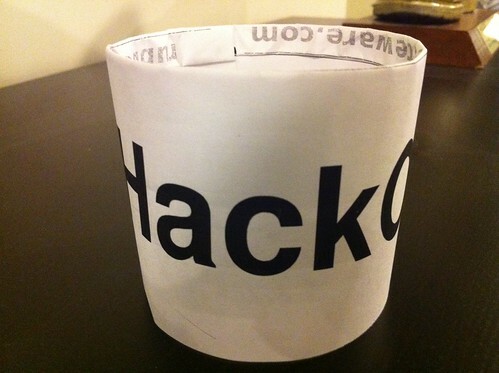 HackOTT was just an awesome hackathon. AWESOME. There is no other way to describe the incredibly talented developers who came out on Saturday and built 15 applications in the span of 6 hours. We have a gigantic list of people to thank for making HackOTT possible and we will get to that but right now, the spotlight is on the developers who came and built. For the record: this was our largest hackathon with over 80 people registered for the event – so mad props to the entire HackOTT team and volunteers for organizing an event that went out without a hitch! Following our HackOTT schedule, we had an awesome breakfast provided by our sponsors and gathered to hear the 5 minutes API introductions organized by the API providers. Standing room only! A bit of brainstorming, a bit of team gathering and planning and we were off to the races at 11 AM with a number of applications under development. We had a few more stickies added and a few more removed throughout the day but we ended up with a total of 15 applications built that Saturday. HackOTT’s presentation rules for any application built during the day: were that the application had to be completed and could be demo-ed to the judges at 5 PM. If the application was not completed it was not considered for judging and if it crashed or could not be demo-ed while on the podium it was also elimiated from the judging. Each developer had 3 minutes to present their application to the judges and the entire HackOTT crowd. Pressure! This is an application that allows you to make quick online reservations with any restaurant in the world. Simply find a local restaurant on a map and complete the online form. Reservely will get in touch with the restaurant automatically via voice and will get a confirmation of your reservation. Jevy tells us he has never won anything – besides his mother’s love – so we are very happy for him! His advice to future hackers: build your app end to end. Read his detailed blog post. I am looking forward to Jevy and Brad to find a few more hours to polish this application and fully release it. This is an application that allows you to send a selection of coffee shops, restaurants or anything to your friend’s cellphone so that the two of you can pick a location that you are interested in. For example: you both would like to find a coffee shop that is nearby to work at. You can start by getting a list of the nearby coffee shops and via the application share them with your colleague so that he can pick the one he would like to recommend. Both users see the same list of available coffee shops and get to make recommendations. This is the easiest way to manage your zip list on the go. Using a bar code scanner and zip list, you can scan any DVD and directy add it to your zip list queue. As soon as the DVD is avaiable at zip.ca it will be shipped to you. Very practical. Applications built that landed the 4th and 5th place respectively include: Icarus and DateShake. This is a photomosaic App. But rather than using a photograph for the creating of the mosaic, Christine is using a video! Christine used the iSight camera in her MacBook as a video source for the mosaic. For the first, simpler implementation, you could click anywhere on the video, and the app would show a collection of images that matched that colour. If you clicked a second time, it would show you a collection of images that were half of each colour, and so on (up to 5 colours – at which point the oldest colour is dropped). Christine also pushed the envelop by creating a second type of mosaic: using a video as a constantly updating photo mosaic. Christine detailed her implementation in a blog post. For creativity Icarus gets a 10/10! Simply enter your twitter handle, and shake your phone. DateShake suggests one of your twitter friends, a restaurant from the YellowAPI, and a movie from Zip. Don’t like the results? Shake again. DateShake was also Zip.ca winner of the best use of the Zip API. In the spirit of the best use of an API: we also decided to award Christine Davis a prize for the best use of the Piximilar API for her Icarus application. and a GIANT THANK YOU TO SHOPIFY! for letting us crash their offices! Without kindness there is no community! Our next hackathon will be in Waterloo, then Vancouver, then back to Toronto and anywhere else you welcome us. Stay in touch, sign up for our newsletter!